Kunjumon Chacko freezes. His arm cuts through the air, palm facing out, ordering the group to stop. Behind the peak of a small hill just 100 meters away, a family of five elephants stand alert. Over two days inside Periyar Tiger Reserve, a national park in South India, Mr. Chacko and his colleagues demonstrate time and time again their knowledge of this forest and its inhabitants. Since they were teenagers, the men have shared the lush Cardamon Hills and shores of the Periyar River with bison, elephants, and tigers – originally, as poachers. For more than 20 years, they hunted the animals they now protect. Today, they work as tour guides and caretakers of the national park, thanks to an initiative by the local forest department. Once the problem, they’re now the solution: a root-cause approach that helped win Periyar a biodiversity award from the United Nations in 2012. This year marks the 20th anniversary of their appointments as forest officers. The project is nearing its close, however: The men are all in their fifties, and when the last of them retires, so will the experiment. The former poachers regularly patrol the forest, and three times a week they take a group of six on an overnight Tiger Trail. Seeing the reclusive cats is unlikely, but following the territory markings of their enormous claws on the trees offers a thrill of its own. Camping is only possible because the 11 former poachers know the forest and its dangers like the back of their hands. Every trek is accompanied by at least two former poachers and an armed guard – again, not for the tigers, but to scare off elephants in case they should charge. When the group was approached by the forest department, poaching and smuggling were on the rise. Infrastructure improvements had made traveling inside the park easier – including for poachers. Encouraged and financially supported by the World Bank’s India Ecodevelopment Project, which aimed to increase collaboration between conservationists and locals, a few enthusiastic forest officers at the reserve took action. 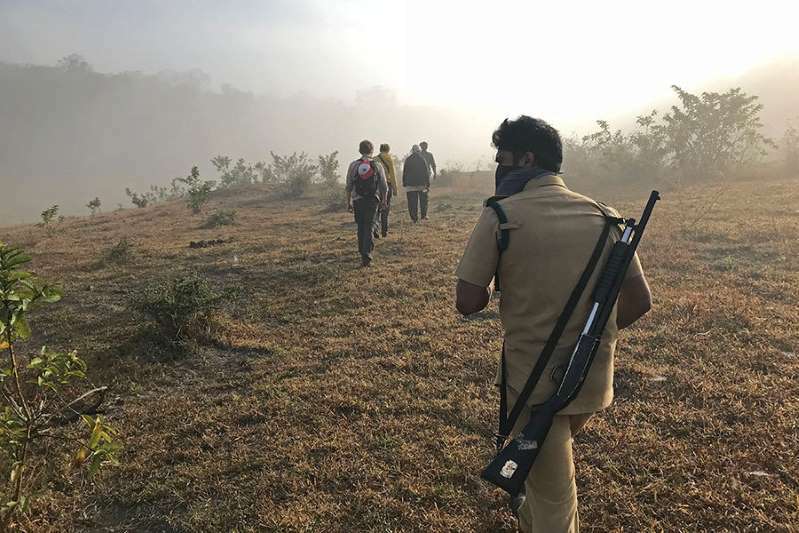 Facing a swelling number of poachers – who were armed, and in need of a steady income – the rangers knew policing alone wouldn’t eradicate poaching from the Cardamon Hills. At the time, Periyar’s tourism industry was less developed, making opportunities to make a good living more scarce. Many of the poachers were fighting court cases, or effectively on the run from the law. But, with the blessing of the government, the forest department offered them a way out: all outstanding charges would be dropped if they helped put a stop to Periyar’s poaching problem. Twenty of them agreed, and were given training on forest conservation and protection, as well as tourism activities. Koshy was even elected into local office, and served two terms as an assemblyman. The program has worked for the park, as well. The men knew the modus operandi of their former fellow smugglers and poachers: which routes they took and which markets they approached. “Now we can say there is zero poaching in Periyar Tiger Reserve, because these guys are in the forest,” says ecotourism officer Syam Krishnan. The number of tigers has risen to 48, up from 21 in 2002, and cinnamon trees have recovered as well. Smugglers after its valuable bark had almost eradicated them in the park. When the program began in 1998, there were 20 guides. Today, 11 remain. But the end of the program is looming, with their retirement on the horizon. With the development of Periyar’s tourism industry, there are now more job opportunities for young people nearby, reducing the pull of poaching. But park officials have established dozens of anti-poaching camps, basecamps for other patrol squads, to try and prevent illegal activities from erupting again. It remains a major problem elsewhere in India, however. Other national parks have shown interest in Periyar’s concept, but so far, none has achieved its own poachers-turned-protectors program. In one attempt to reduce poaching, the West Indian state of Maharashtra decriminalized killing poachers on sight in 2012, after eight tigers had been shot within one year. At 6 a.m., during the morning trek on the Tiger Trail, a thin layer of fog floats over Periyar’s rolling hills. The birds are not yet too hot to sing, and the park is blanketed in a soft light. Then he laughs, looks ahead for Koshy and the others, and elegantly manoeuvres through several large piles of bison dung.